Well, just whom could Amy mean? I think you’ve got this one figured out. I shall say no more. Except that the next update will be on Thursday instead of Wednesday. I apologize for the delay. The deadline for that project is coming up, and I need some time to finish it. And, I’ll tell you more about it next time. I think you’ll be quite excited about it. Speaking of exciting, last week I was the Spotlighted Comic over at the Webcomic Underdogs. If you’d like to see the critiques, or read an interview with Yours Truly, the link is here. And she’s wearing her introductory outfit! I love it. Thank you, J! By the way, there’s another sweet piece of art coming up with Thursday’s strip. Some more of that wonderful crosshatching in panel two! I’d love to see a high resolution version of that panel. 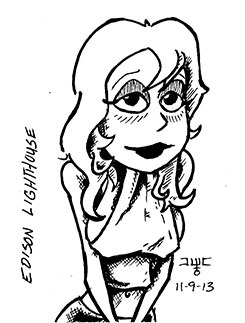 Thanks for posting my version of Edison! I don’t have it figured out, but then again, I am notoriously slow. From the way Amy phrases it, I’d say Edison, but what is there for her in Stephanie’s universe? What am I missing? Ah, patience, young Jedi. All shall be revealed in the fullness of time. And you’re not slow-you got melaredblu’s art long before I did.